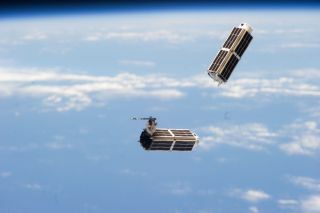 Two of the 28 Dove cubesats that make up Planet Lab's "Flock 1" constellation are seen deploying into orbit from the International Space Station on Feb. 11, 2014. Planet Labs has raised $95 million from investors in its latest round of financing, representatives of the San Francisco-based startup said. Planet Labs designs and builds Earth-observation satellites that are just 12 inches long by 4 inches wide by 4 inches tall (30 by 10 by 10 centimeters). Each of these cubesats, which the company calls "Doves," can capture imagery with a resolution of 10 to 16.5 feet (3 to 5 meters). "Planet Labs is on its way to becoming the next great commercial space company," returning investor Steve Jurvetson, a partner at the venture capital firm Draper Fisher Jurvetson and a board member of Planet Labs, SpaceX and Tesla, said in a statement. "Leveraging the lower cost of access to space, businesses like Planet Labs are redefining space as the new frontier of innovation."